IOWA CITY, Iowa — The road to the Big Ten championship still runs through State College. The Iowa Hawkeyes — always game and especially so here at night — did more than threaten to knock the Nittany Lions off their perch Saturday night at Kinnick Stadium. They actually grabbed the wheel of the Nittany Lions’ Big Ten title car and knocked it off course, but the Penn State offense, featuring the amazing tandem of Saquon Barkley and Trace McSorley, wrestled back control of their vehicle and drove it to one of the most incredible victories in school history. The final score of 21-19 and the Nittany Lions’ winning drive that culminated with the clinching touchdown on the game’s last play as time expired will be forever etched in the minds of Penn State fans who were privileged to see it. The difference, for starters, was Barkley’s greatness. His 358 all-purpose yards set a new school single-game record as he simply refused to go down — running through, around and jumping over Iowa defenders all night in the best one-game performance by a Penn State running back ever. McSorley was equally impressive in the clutch. He’s been bringing Penn State back — against USC, Wisconsin, Ohio State and Pitt last year — since he first stepped on the field with the Lions down 24-3 against Georgia in the TaxSlayer Bowl. Now he adds a game-winning touchdown pass to his resume, in one of the tougher places to play in the Big Ten (just ask Michigan last year), on the game’s final play. McSorley didn’t play his best game Saturday night, but he could not have been better when the Lions needed him most. He probably will not play on Sundays, but a gutsier quarterback Penn State has never had. McSorley drove the Lions 80 yards in the last 1:42, going 7-of-11 for 68 yards, rushing for another 12 and converting two fourth downs. Look at the final statistics, and it’s hard to believe Iowa was even in this game. The Hawkeyes only ran 45 plays to Penn State’s 99, the Nittany Lions nearly doubled Iowa’s total yardage — 579 to 273 — and had the ball almost 40 minutes. And yet, the Lions found themselves trailing at halftime (7-5) and again with just 1:42 remaining after Iowa took a 19-15 lead on Akrum Wadley’s 35-yard touchdown run. Penn State kept encouraging Iowa by failing to take advantage of great field position, giving up four sacks, committing two turnovers and eight penalties, missing one field goal and getting another blocked. The Lions’ defense only allowed one play in the first half, a touchdown pass after Josey Jewell’s 33-yard interception return, but the unit cracked a couple times in the second half, and forced the offense to add to the legacy it has built over the past 14 games. 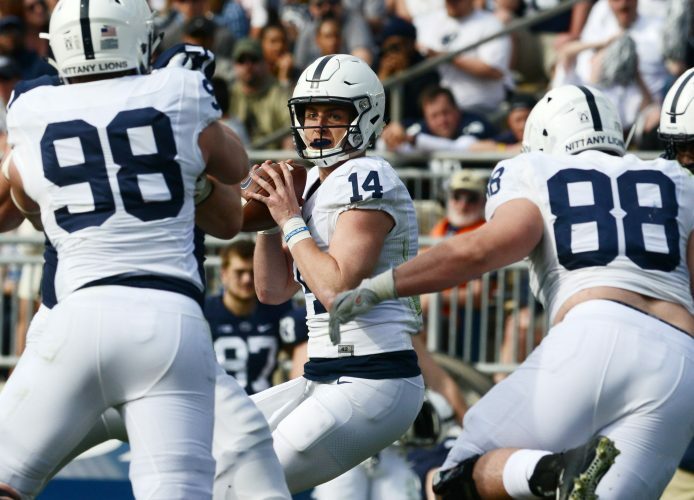 Saturday’s victory, as a two-touchdown favorite, showed Penn State that it’s getting everybody’s best shot now and that its schedule is going to play tougher this year. But the Nittany Lions also showed the rest of the Big Ten that they’ve still got the heart of a champion.